Pokémon isn't the only beloved game franchise celebrating its 20th year in existence. Capcom announced today that – for Resident Evil's 20th birthday – Resident Evil 4, 5, and 6 are heading to Xbox One and PS4. 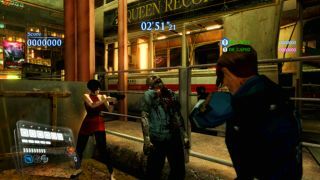 Each game will be offered as individual downloads released over the course of the year, with Resident Evil 6 (RE6) hitting Xbox Live and the PlayStation Network first on March 29. After the ambitious-yet-critically-flawed RE6, the co-op survival horror stylings of RE5 will come out next this summer. Finally, Resident Evil 4 — a game so nice it's been re-released twice — will drop this fall. Each game will retail for $19.99 (or £15.99) and, while all three games will be available digitally, the North American re-releases of the games will also be available on disc in stores. Remastered versions of the original Resident Evil and Resident Evil 0 have already landed on Sony and Microsoft's latest consoles. A remake of Resident Evil 2 has also been confirmed by Capcom. This means that every core entry in the Resident Evil series — save for Resident Evil 3 — will be available soon on current hardware. Each of the modern Resident Evil games has its share of fans and haters, but the option to choose also means that PS4 and Xbox One owners have got a selection of good things on sale, stranger.